Eaton has introduced two new products – a Thin Client (TC) and Personal Computer (PC) version, added to its range of MTL GECMA HMI workstations. The company can now offer a complete range of workstations based on a common platform design. As such, plant managers can reduce operation costs, optimise productivity and increase plant safety, with the additional benefits of reducing space in the cabinet, and future-proofing the plant. 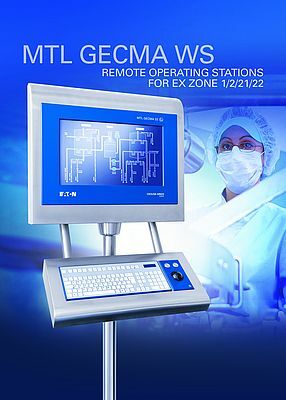 The TC and PC versions complement the existing MTL GECMA Remote Terminal (RT) which has a unique modular design. These next generation HMIs feature state-of-the-art technology to offer unparalleled levels of safety, and are approved to global hazardous certification for Zone 1 environments. As a result they offer safe handling on site and guarantee high reliability in hazardous EX zone areas in chemical, pharmaceutical, refinery plus the oil and gas industries worldwide. The TC version is designed for virtualisation applications, for example for batch control. The workstation works with a client server in the safe room across a LAN. This saves space in the cabinet as users don’t need a dedicated PC and the user can control up to 255 HMIs from a single server. The PC version is stand-alone working across the LAN. It has state-of-the-art system hardware, which meets the needs of the most complex applications with high computing power demand, for example packing. The workstation has a ‘watch dog’ function which automatically monitors the operating system and if there is no input from the system it automatically re-starts itself. This avoids hard re-starts, which saves time associated with turning the system on and off, and minimises any stress on the system for increased reliability. RT is a point-to-point device, with one workstation assigned to one PC in the safe area. It features a keyboard, mouse and video and is perfect for controlling tablet coating or dry granulation machines. The RT terminal’s modularity means upgrades to existing installations are quick and easy, which can save time, and minimise costly maintenance and downtime. Traditionally, the whole unit would have to be dismantled off site, but with MTL GECMA, individual parts can be replaced simply on site, increasing plant availability.